The early Lowland Logans originated from Galloway. It is documented that two of them were killed in Spain in 1329 on their way to the Holy Land with the heart of King Robert I (the Bruce). Sir Robert Logan of Restalrig (d. 1606) had his bones exhumed and paraded in Parliament so that he could personally be convicted of treason. The Highland Logans claim descent from the Logans of Drumderfit in Easter Ross. See also MacLennan, with whom the Highlander Logans are closely linked. Little indeed is known of the Logans as a Highland clan, but that little is tragic enough—so tragic as to have brought about the change of the name Druim-na-clavan, the height on which the stronghold of the chiefs was built, to Druim-an-deur, the "Ridge of Tears." The estate, now known as Druim-deur-fait, in Eilan-dhu, the Black Isle, in Ross-shire, was still, in the middle of last century, in possession of the representative of the family, Robert Logan, a banker in London. The word Logan, Laggan, or Logie, in the Celtic tongue signifies a hollow place, plain, or meadow, encircled by rising grounds. As a place name it is common throughout Scotland. Logie is the name of parishes in Clackmannan and the north east of Fife, while Logic-Easter is a parish in Ross and Cromarty, Logan Water is the old name of the Glencross Burn in the Pentlands, and Port-Logan is a village in the south of Wigtonshire. The original seat of the Logans in the north seems to have been Druimanairig in Wester Ross. Early in the fourteenth century, however, the original line of the chiefs ended in an heiress, Colan Logan, who married Eachan Beirach, a son of the Baron of Kintail, and carried the estates into his possession. Eachan took his wife’s name, and, dying at Eddyrachillis about the year 1350, left a son, Eanruig, from whom descended the Sliochd Harich, who continued the race in the island of Harris. The Logans in the Highlands are often linked to the MacLennans due to a colourful (but unreliable) legend about a chief of the Logans in Easter Ross who was killed in a feud with the Frasers. His wife gave birth to a child a few months later who later became a priest. His son was named Gillie Fhinnein (disciple of St Finnan) and MacLennan is the anglicised version of this name. All the Logan/Logie names are probably derived from the Gaelic word "lagan" (little hollow) which became parts of place names in various parts of Scotland. One of the most important sources of the name was Logan in Ayrshire but there are examples of the name in Dryburgh in the Borders in 1204, Adam de Logan in Gowrie in 1226 and Thurbrand de Logan in Cunningham, Ayrshire. There were four landowners of that name who signed the "Ragman Roll" of King Edward I in 1296. Two knights named Logan accompanied Sir James Douglas on his journey to take Robert the Bruce's heart to the Holy Land. They died with Douglas fighting the Moors in Spain in 1329. There was a landed family of Logans in Forfar, Angus for hundreds of years until the last of the lairds died without issue in 1802. Other Logans were established in lands in West Linton (south of the Pentland Hills in the Scottish Borders). Sir Robert Logan of Restalrig in Edinburgh married a daughter of King Robert II and was Admiral of Scotland in 1406. The family owned Fast Castle in Berwickshire but they fell from favour and the last Logan of Restalrig died an outlaw and the castle was taken over by the Homes. Logie/Loggie were located in different parts of the country from Logan. Wauter de Logie also signed the Ragman Roll and Sir John of Logy is reputed to have been one of the nobles who conspired with King Edward II of England and the Earl of Warenne when they attempted an invasion of Scotland in 1320. A coat of arms was granted to Logie of that Ilk (signifying a clan chief) but they were never subsequently recorded in the registers of the Lyon Court. 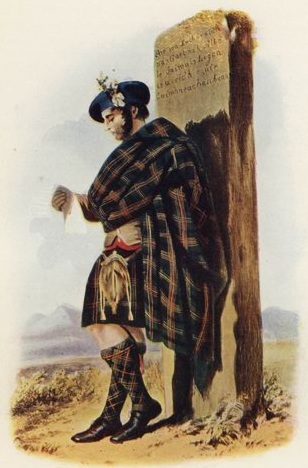 "The Scottish Gael" was the first work in English to try to give a history of Highland dress and it was written by James Logan in 1831. In modern times, Jimmy Logan is the most famous of a large theatrical family. The Logan clan motto is "Hoc Marjorum Virtus" which means "This is the valour of my ancestors". BADGE: Conasg (ulex Europaeus) whin or furze. SLOGAN: In the north, Druim-an-deur; in the south, Lesteric lowe!